Isn’t the Key Word ‘ILLEGAL’ in Illegal Immigration? Thanks largely to the Mainstream Media’s (MSM) Trump Derangement Syndrome, propaganda created hysteria has occurred about illegal immigrant children being separated from illegal alien parents entering and getting caught by immigration authorities at the U.S. border. I claim this is a manufactured hysteria because of the fact former President Obama used the separation policy extensively with zero moral outcry from the MSM. I find it particularly disgusting that this same MSM acts like President Trump’s zero toleration policy on illegal immigration initiated the child/parent separation policy. On a personal level I don’t have a problem with separating illegal alien children from their illegal alien parents. The key word is “ILLEGAL”! Since parents are adults knowing fully well that breaking a law will have legal consequences. It is unreasonable to hold the illegal alien children accountable for the illegal alien parents law breaking actions. The Dems have successfully used the manufactured hysteria to get a political win which I am certain they hope is a pawn move for open borders. The Dems have cajoled President Trump to use the power of Executive Order to keep children and parents together when they illegally enter the USA. I can’t wait to see how the government funds the policy change since the Dems have no intention of funding any immigration reform proposed or supported by President Trump. After all, a Presidential EO is only as good as the President is in Office. AND an EO does not have funding power, that can only come from Congress. AGAIN, thanks to MSM created hysteria and their comrade accomplices the Dems, the camps where the illegal alien children were housed are being housed have been equated with Nazi concentration internment camps. The kind of camps used by Nazi-Germans to ethnically cleanse Jews from the earth during WWII. While the MSM showed photos of illegal alien children in dog cages from the Obama Administration days, the reality was illegal alien children experience something more akin to Summer Camp that American parents would send their kids to (if they could afford it). Visit to Southwest Key facility for illegal alien children separated from parents – El Cajon, CA – June 15, 2018. Footage provided to journalists by HHS. My point is I had little problem with the children/parent situation. If the illegal alien parents didn’t want to be separated from their children, they should either not have made arduous trek from wherever or at some point begin the process gaining legal immigrant status or legal refugee status. Now the inspiration for this blog post comes from Ari Bussel. Bussel sent an email conversation between himself and a gal named Joy. Bussel was responding to a poor-illegal-immigrant-children-plight email seeking political and financial support to deliver these abused kids from President Trump’s zero tolerance policy. Just a head’s up about the Joy portion of the email. She provides a Liberal plan of action including links to enable a Liberal action response. Obviously, I am not suggesting my fellow Conservatives to work the Liberal agenda. There is so much controversy around the sweet, innocent children (just use the word “children,” and the heart melts) and the hated, horrible, devilish President Trump. He must hate them! Following is an illuminating exchange – Joy is my mother’s cousin. Joy’s parents were married in Chicago in 1929. My mother side of the family was then in Europe, where both were to be exterminated just over a decade later. Jewish Americans have traditionally been Democrats. Joy, and most of our entire extended family (numbering many hundreds, including one that every kid in the country would recognize the name), is Democrat. So we disagree and fight and love each other not any less. However, comparing the children of those trying to enter the country illegally and the amazing treatment and conditions they receive to children – like my parents – during the Holocaust is an affront to common sense and to the memory of all those of perished. While I did not receive the below e-mail (it may have gone to one of my old gmail addresses which I am not using), my father did. I am not sure if “disgust,” “utter shock” or simple “bewilderment” will be the most appropriate manner to describe my father’s (actually my parents’) reaction. Allow me then to respond based on what I have observed and heard this morning. Both my parents are Holocaust Survivors. My father’s mother went out one day to bring food, never to return. Our good Polish neighbors apparently informed there was a Jew in their midst. I will not enumerate all the family members who perished during the Holocaust, luckily there were a few, so very few, who survived. My father and my uncle escaped the Warsaw Ghetto before the Uprising. We can talk about forced- or other separation of children from their parents. We can think about more than a million children murdered, and those others who actually survived had their childhood robbed and the rest of their lives affected. Both my parents are exactly such “Child Survivors” (they were children at the time), and what happened them affects them to this very day; physically and emotionally. We can talk about a brave teacher, school principal, who would not leave his children and walked with them to the very end, although he was extended the opportunity to save his own life. Children were shot, butchered, burned, enslaved, put to hard-labor. That was then; under the Nazi regime and with the active and jubilant participation of the local populations (yes, including the Poles). To compare anything that is happening today in the USA (or for that matter in Israel or elsewhere) to the Nazi Death Camps (lest the Poles get insulted) does great disservice to the memory of the more than six millions of us – our own family – who were butchered and systematically murdered with the intention of annihilating us all. How can one in good conscience compare the almost “vacation-style” conditions the children of people trying to illegally enter the country and the treatment they are receiving to, for example, the Warsaw Ghetto? And remember, this was nothing compared to, for instance, Auschwitz-Birkenau. Every Shabbat I spend time with Survivors of these camps. Some will be (and are) still able and willing to share their stories; of what it meant to survive the horrors that were a moment-to-moment, non-stopping, on-going Inferno. You are correct – the issue is NOT political (Republicans / Democrats, Deplorables / Adorables, those who think the President does a good job and those who give him not an ounce of leeway). For any one from our family to compare modern day conditions here in the USA and treatment of others – be they illegal immigrants, refugees or detainees – to Nazi Germany and the Concentration Camps of Ghettos is plainly wrong. This definitely hurt both my parents, for it apparently brought back memories buried so deep; memories that can never be separated from who they are; from who and what we are. This is personal – deeply so – as it affects OUR family. We are usually very careful about the distribution of our political e-mails, realizing that all our friends and family do not necessarily share our angst about what is happening in the U.S. However, we are sending this widely, regardless of one’s political party affiliation or beliefs. Separating children (including babies) from their parents and incarcerating them violates America’s values. This conjures up Nazi concentration camps and Japanese internment camps. As morally repugnant as the Japanese internment camps were, children were not separated from their parents. Re #4: VOTE: Shockingly, only 58% of Americans voted in the 2016 election. We have heard too many people say, “I didn’t vote because I didn’t care for either candidate.” We all demand and expect our rights. With rights come responsibilities. A major responsibility is to VOTE. We must convince people that even if there is a situation where they do not like either candidate, they need to vote for the “least bad”. We hear a lot about Russia, Comey, etc. affecting the election results. Those who did not vote actually did make a choice with their inaction. Re #5: DEMONSTRATIONS: Saturday, June 30 at noon there will be hundreds of marches across the U.S. protesting government forced separation of families. You can click on this site and enter your zip code to find the march closest to you. Re #6: DONATE: We have received lists of organizations that are helping separated migrant families. We do not have personal knowledge of any of these but looked up each of the organizations listed by Adam Schiff, CNBC, and Daily Kos. Re #7: SANCTUARY HOME OR FOSTER HOME: We do not know how to go about this but know that many people (including us) would like to offer their homes to help. If anyone knows how to go about this, please advise. Mr. Bussel writes regularly. For the past decade, his weekly columns appeared in print in Israel Jewish Life, Shalom LA, Muslim World Today and Israeli Week. Mr. Bussel’s articles appear on numerous websites, including Canada Free Press, Free Republic, NewsBlaze, SlantRight and OpEdNews. He is a member of the Los Angeles Press Club. Author oneway2dayPosted on June 22, 2018 Categories Conservative, Crime, Democrats, Immigration, Left Wing, News and politicsTags Ari Bussel, Democrats, Illegal Children, Illegal Immigration, Illegal Parents, Illegal=Crime, Illegals Internment, Nazi Camps1 Comment on Isn’t the Key Word ‘ILLEGAL’ in Illegal Immigration? This post on Blogs for Victory expresses the frustration felt by real American Patriots who have zero interest of a Leftist transformation of American culture. I am one. Are you? If you feel the frustration, then vent it in the comment section. Keep in mind, if your venting is awesome, it will be cross posted on my blogs. We have often wondered if a new civil war would ever break out. If leftists would ever take to arms to defend their ideology, or if they would be too cowardly as many of us have surmised. Well make no mistake about it folks, we are at war with a new, hyper-radicalized Democrat Party, aided and abetted by the Progressive Media. The Democrats, spurred on by their media masters, have done a political 180 over the last 20 years and now openly advocate anti-American views, and actively support policies that are completely destructive to our society and way of life. Consider that every single Democrat voted against a tax break for the average American worker; they have opposed all efforts to secure our borders; they defy Federal immigration laws; they obstruct Federal law enforcement, they encourage and financially enrich our foreign enemies; they impose punitive regulations on our domestic businesses, they actively work towards destroying our energy independence; they defer to the World courts rather than our own judiciary; they actively promote domestic policies that disadvantage American citizens; and they harbor deep contempt for anyone who challenges their world views. In other words, they are in the process of trying to demoralize and completely destroy traditional America, and we had all better wake up and realize this very sobering fact. Sowing discord? The Russians are amateurs compared to our progressive media. The author “Cluster” aka Carl Shaver. Edited by John R. Houk for this blog. This email provides a “free” option toward the end that will send you to FaxCongress.org. There the wording focuses more on Senator Al Franken, Franken tried to push a promote-homosexuality agenda in the school system in 2010. Thank God Almighty that legislation failed. NOW President Obama is trying his typical unconstitutional path via the Federal Bureaucracy (The Federalist and WND) to force transgender/homosexual education in school education including the college level. This petition requests that you OPPOSE and FILIBUSTER the Elementary and Secondary Education Act, formerly known as “No Child Left Behind.” Specifically you must oppose Senator Tom Harkin’s (D-IA) addition of language proposed by Senator Al Franken (D-MN) that requires mandatory pro-homosexual lectures to all public school children, promoting sin under the disguise of bullying prevention. 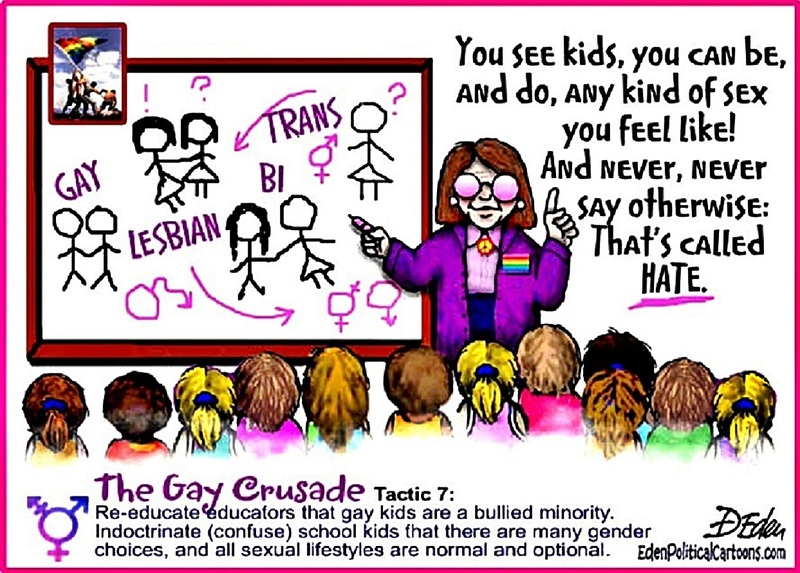 STOP THREATENING TO CUT FUNDING TO PUBLIC SCHOOLS THAT WON’T PROMOTE HOMOSEXUALITY AS NORMAL. The legislation’s text promoting homosexuality begins on Page 694 of the massive school bill, over 1,150 pages. URGENT PETITION! Stop President Obama from homosexualizing public school classrooms. Stop federal curricula to kids. Please select, sign, and WE WILL FAX your petition to all 535 members of Congress (saving you time!) to filibuster Senator Al Franken’s agenda to re-educate your Children with his liberal agenda. Adults including parents who tell their sons to become daughters, and vice-versa, are abusive and harming their children, confirms a new study by the American College of Pediatricians. In a direct threat tantamount to child abuse, President Obama will issue a directive forcing all public schools to open girls bathrooms to confused boys, or lose their school funding. The New York Times reports: “The Obama administration is planning to issue a sweeping directive telling every public school district in the country to allow transgender students to use the bathrooms that match their gender identity. “A letter to school districts will go out Friday, adding to a highly charged debate over transgender rights in the middle of the administration’s legal fight with North Carolina over the issue. The declaration — signed by Justice and Education department officials — will describe what schools should do to ensure that none of their students are discriminated against. “It does not have the force of law, but it contains an implicit threat: Schools that do not abide by the Obama administration’s interpretation of the law could face lawsuits or a loss of federal aid. “The move is certain to draw fresh criticism, particularly from Republicans, that the federal government is wading into local matters and imposing its own values on communities across the country that may not agree. It represents the latest example of the Obama administration using a combination of policies, lawsuits and public statements to change the civil rights landscape for gays, lesbians, bisexual and transgender people. “After supporting the rights of gay people to marry, allowing them to serve openly in the military and prohibiting federal contractors from discriminating against them, the administration is wading into the battle over bathrooms and siding with transgender people. “No student should ever have to go through the experience of feeling unwelcome at school or on a college campus,” John B. King Jr., the secretary of the Department of Education, said in a statement. Friends, President Obama is bullying public school kids aggressively. Let’s take a stand today for public safety of innocent children. Who is Dr. Chaps? Read his bio here. P.S. Prefer to donate by mail? Please mail paper check or money orders to: The Pray In Jesus Name Project, PO Box 77077, Colorado Springs, CO 80970. Last week I shared a CNSNews.com story about California State Attorney General Kamala Harris ordering and executing a search warrant of David Daleiden’s private residence fishing for more video footage of his exposé of the Planned Parenthood marketing of born alive then murdering babies for their anatomical body parts. Characteristically of America’s Left dominated justice system the courts actually went after Daleiden rather than the evils of Planned Parenthood breaking the law. Daleiden and Sandra Merritt were indicted in Houston Texas under the Grand Jury guidance of another Left Wing Texas State Prosecutor Devon Anderson followed her corrupt Planned Parenthood connections. Why haven’t State and Federal authorities exhaustively investigated Planned Parenthood for trafficking organ parts taken from living individuals? Even to a Leftist, doesn’t an unborn baby become a legal living person if born alive? I believe abortion is murder, but for God’s sake aren’t all children after a live-birth a legal person with Constitutional protections under the rule of law? David Daleiden and the Center for Medical Progress team members that exposed this illegal practice should be given ticker-tape parades around the major cities of America. AND NOT PERSECUTED WITH PROSECUTION! 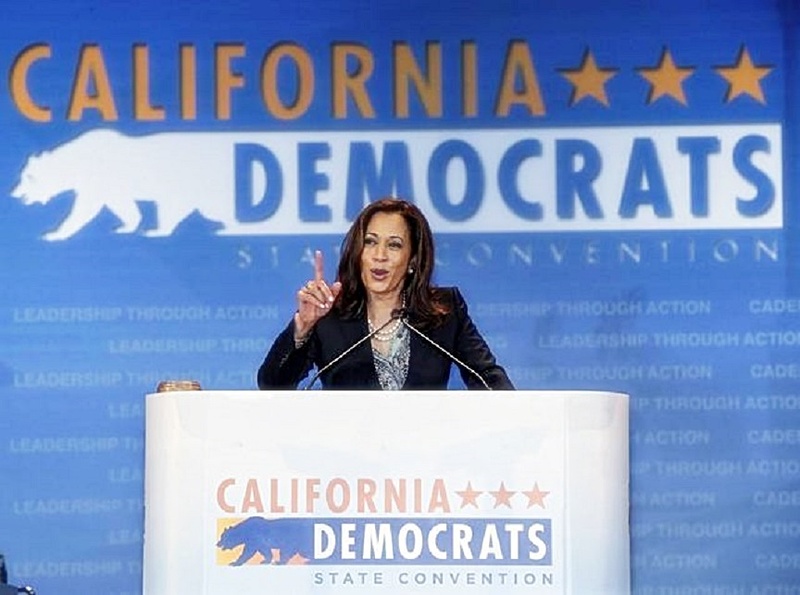 After pro-abortion California Attorney General Kamala Harris stole unreleased video footage concerning Planned Parenthood during a raid on the home of David Daleiden, the director of the Center for Medical Progress, pro-life groups called for her resignation. Now they’re leading a rally at her office to continue that call. 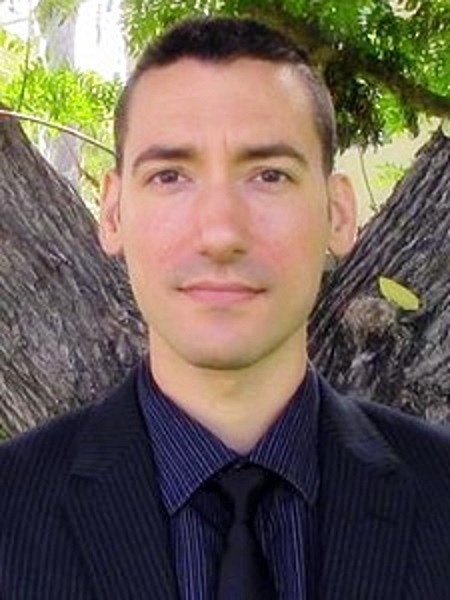 California authorities seized a laptop and hard drives containing the video footage collected during Daleiden’s 3-year investigation of Planned Parenthood’s involvement in the illegal sale of aborted baby remains, according to a written statement made by Life Legal Defense Foundation, which is helping to defend Daleiden. Harris, a pro-abortion Democrat, chose to focus her investigation on Daleiden and his associates rather than Planned Parenthood, even though the video footage so far released by Daleiden’s Center for Medical Progress shows clear evidence that Planned Parenthood was illegally altering abortion procedures to endure intact organs targeted for harvesting then selling the organs for profit. Since the California Department of Justice, under the leadership of Democratic State Attorney General Kamala Harris, searched the home of David Daleiden, there have been numerous news stories noting an apparent conflict of interest in Harris’ investigation of Daleiden and the Center for Medical Progress that ignores obvious evidence of illegal conduct on the part of Planned Parenthood. Planned Parenthood has donated $81,000 to Harris and, because of the massive conflict of interest, pro-life groups are calling for her resignation. Now, pro-life groups are protesting at Harris’ office in Sacramento and Kristan Hawkins of Students for Life of America says pro-life students will be leading the way. Brian Johnston of California Pro-Life Council joined in criticizing Harris. “Last year, David Daleiden’s videos of Planned Parenthood officials arranging the sale of human organs from aborted children stunned the world. While seven other state’s Attorneys General launched investigations into the PP actions in their states our state’s ‘top cop’ decided to do the opposite,” he said. “She ignored PP’s macabre actions and instead decided to pursue and silence the investigator! At that time we knew of at least several sizable-political donations directly from PP to Harris. Since then more than $80,000 of PP political donations to the AG have been revealed. Her campaign web-site even includes a ‘petition of support’ for Planned Parenthood,” he added. LifeNews.com is an independent news agency devoted to reporting news that affects the pro-life community. With a team of experienced journalists and bloggers, LifeNews.com reaches more than 750,000 pro-life advocates each week via our web site, email news reports, social networking outreach and weekday radio program. Formerly the Pro-Life Infonet, LifeNews.com has been harnessing the power of the Internet since 1992 to bring pro-life news to the pro-life community. We’ve developed a reputation for fairness, accuracy and timeliness in our two decades of service. We are not affiliated with any organization, religious group, political party or church denomination. Justin Smith provides many legitimate reasons why Conservatives should think twice before committing to a Trump nomination for POTUS. The thing is I don’t believe Trump has become popular among Republican voters because of his ideology. The Donald has become representative of American Conservative and Independent displeasure with the business as usual politics exacted by Leftist Dems and Establishment Republicans. I will not be voting for Donald Trump in my Oklahoma Primary. However if he did win the GOP nomination I would vote for him because he would shake up the way things operate in Washington DC. Trump will manage the Executive Branch as a CEO manages a major corporation. I have no doubts that government management will step on the toes of Leftists and Conservatives alike. I doubt Trump will change any social issues dear to Conservatives but I suspect he will not add to the Leftist view of social issues. On money management of America’s economy I believe Trump will ignore all the utopian Leftist agendas. On the other hand it will remain to be seen if he cuts Big Government unless he views the operations of pork programs are not profitable. I think you see my point without me competing with Justin’s thoughts which AGAIN are very legitimate concerns. Americans must not entrust the future of these United States to Donald Trump, despite his accurate assessment concerning the illegal immigration, economic and trade deficit problems. 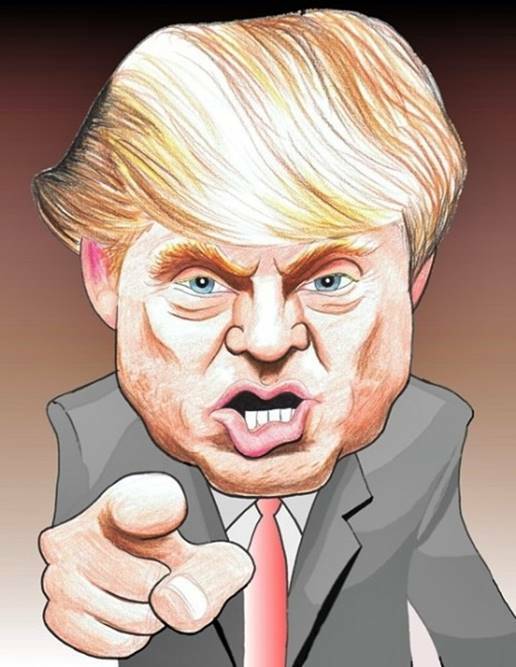 Trump is politically confused, lacking core principled moral values and integrity; and, he is a master of corruption in U.S. politics, who has admittedly bought politicians to increase his own wealth. Trump is no friend to the U.S. Constitution, and rather than being America’s salvation, a President Trump will only serve to the greater detriment of America. Trump’s disdain for the Bill of Rights and individual liberty is readily apparent, when one reviews his attempts to steal private property for his own use through the misuse of eminent domain. Trump colluded with New Jersey’s Casino Reinvestment Development Authority in 1994 to forcibly remove Vera Coking from her land, valued at over $1 million, and “compensate” her only $251,000; righteously, Coking beat them in court. And in 2005, Trump told Neil Cavuto (Fox News) that he fully agreed with the Supreme Court’s 2005 ‘Kelo decision’, which legitimized this sort of government-abetted theft of private property. Although Trump attempts to equate his midnight conversion to conservatism to President Ronald Reagan leaving the Democratic Party for the GOP, Trump has changed party affiliation from Republican to Independent to Democrat and back to Republican in a matter of two decades, just in time for the Iowa caucuses. Please note, Reagan’s core values never shifted away from a strong pro-life and pro-Second Amendment position in the way Trump’s values shift much like the changing of one’s underwear from day to day, depending on his own personal agenda and who has his ear at the moment. In 1999, Trump was interviewed by ‘Meet the Press’ when he was considering running for president, under Ross Perot’s reform Party. When asked if he would ban partial-birth abortion, he answered: “No I would not. I am pro-choice in every respect as far as it goes, but I just hate it.” And now, Trump is supposedly “pro-life”, probably in the same manner that Obama supported the Defense of Marriage Act until he did not. Who in their right minds can wholeheartedly support Trump, when he was a Democrat, making massive donations to the likes of Nancy Pelosi, the Clintons and John Kerry and supporting the very “socialist/communist” views of that party as late as 2004 — the very “socialist/communist” views he now rails against? Who is going to be fool enough to actually cast their vote for Trump, once they know that he supported John Kerry — a communist and islamofascist sympathizer — for president in 2004? Trump further exhibited his ignorance, his lack of reasoning and logic and his willingness to jump on the bandwagon behind any idea that appealed to his own fallacious beliefs in 2008, when he praised then Speaker Nancy Pelosi for attacking President Bush for getting the U.S. “into the war [Iraq] with lies.” Trump bought the Progressive talking points hook-line-and sinker and completely ignored the fact that even most of the Democratic Caucus, including Senator Hillary Clinton, supported President Bush’s action based on the very same intelligence — the only intelligence — that they and Bush had been given by U.S. and allied intelligence organizations. President Reagan’s son, Michael, recently told ‘Politifact’ that Donald Trump is the candidate who is least like Ronald Reagan. He countered Trump’s August assertion that he had a strong relationship with President Reagan by asking “exactly how many state dinners [was Trump] invited to?” Michael Reagan also suggested that Trump could not win the national election. With Trump still giving the Clinton Foundation money in 2015, can YOU honestly say that you would trust Trump to govern the United States in an honest and constitutionally acceptable manner? Even though a President Trump may reduce the Depts. of Education and the EPA, America is quite likely to witness Big Government expand in other sectors, more crony-capitalism/corruption and an ingrained oligarchy and the further abuse of our U.S. Constitution. Even though everyone learns new information throughout their lifetime, it usually only leads them to minor shifts in their core beliefs by the time they are well past their thirties, but Donald Trump has shown a pathological desire to change quite often between two most divergent political philosophies — the conservative belief of freedom under the law and the progressive belief that control is better than freedom. America does not need anyone in the White House who has shown such uncertainty in what they truly believe and hold most dear in their heart of hearts. Aside from all of this, I cannot in good conscience vote for a person to be our U.S. President, who thinks “bigly” is a word and cannot quote a single verse from his “favorite book”, the Bible, when pressed to do so. America needs an intelligent, knowledgeable Constitutional conservative, who will defend our religious freedom and the First Amendment, along with an equally forceful defense of the entire Bill of Rights, rather than the closet Progressive Trump and his convoluted understanding of the U.S. Constitution. America needs a man or woman, who is confident enough in their sense of righteous purpose to forcefully defend America and Her allies in the cause of Liberty — someone guided philosophically by the likes of Barry Goldwater, William F. Buckley and Ronald Reagan. America needs a patriot, who recognizes our nation’s promise and the potential for opportunity that still remains, found in conservative principles, and, they will know that “In God We Trust” gives us hope and courage and moves the entire country towards greater prosperity and success. MAF – Stop Obama’s Iran Deal! Move America Forward (MAF) and a number of Conservative websites and Conservative fund raisers are promoting what is billed as a David Zucker ad lambasting the Iran Nuke Deal pushed by President Barack Hussein Obama and his Secretary of State John Kerry. The ad parody is quite humorous and only a minute and a half or so long. I have no doubt many Conservatives and Conservative organization will use the anti-Iran Nuke Deal parody as a fund raiser. Whether or not any particular organization is actually fronting money for paid ad time is irrelevant. This parody is truth in ironic smiles. In the case of MAF, this organization does great work in taking care of our military men and women fighting Islamic terrorists and defending the USA in general overseas with essential needs care packages. MAF is a worthy organization to donate toward. EVEN IF YOU HAVE HEARD Obama/Kerry’s nefarious selling out America and Israel is a done deal. It is worthy to resist right up to any Congressional votes against the deal or any veto override votes that will take place. Even after the obvious damage to our National Security occurs, our American dislike will make it easier for the next President of the United States of America to undo Obama’s Executive Order by-passing the Constitution’s Treaty process. New Anti-Iran Nuclear Deal Ad “Side Effects”! The new ad aims to break through the traditional political chatter and offer a fresh view on Obama’s Iran deal by using Zucker’s satire skills to show how the “side effects” of Obama’s Iran deal are too much of a bitter pill to swallow. This is a bad-to-worse deal that we MUST STOP. The Iranian deal represents a monumental shift in foreign policy and it’s a gamble that could go down in history as the single greatest national security blunder ever made by an American President. Gives $150 billion in cash assistance and from freeing up frozen Iranian assets to Iran’s extremist government. No stipulations on how funds are spent. Iran will be able to sponsor more terror attacks through groups they support and fund. Iran provides their own inspectors to monitor their own facilities and they choose which samples to provide. International inspectors have no access to Iran’s military facilities which could hide nuclear material. Iran can delay any scheduled inspections for up to 24 days, plenty of time to hide incriminating evidence. No plan is in place to re-impose sanctions if Iran does not comply with their end of the bargain. We need your help to spread the message of his ad and get it out on the web and help to help build opposition to Obama’s dangerous deal with Iran! Please make a donation to help keep our efforts going! Blog Editor: The “Side Effects” link in the MAF email has much of the same info in this email. Except the link has a series of photos that include Democrat Senators, Barack Hussein Obama, former Secretary of State Hillary Clinton and Secretary of State John Kerry. Each photo has click and contact to either email or Twitter or both. And below those photos is a paragraph excerpt of the “Side Effects” press release with a continued reading link below that paragraph. Below is that Press Release. 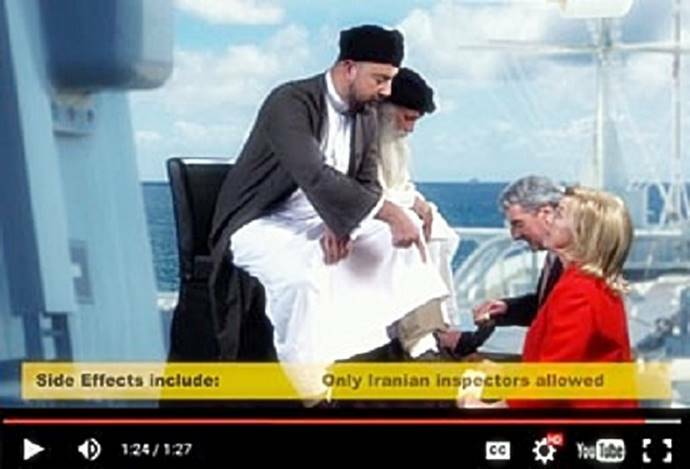 Los Angeles – Hollywood legend David Zucker (“Airplane,” “Scary Movie,” “Naked Gun” films, among many other others) a new video that spoofs the Iran Nuclear Deal and its primary architects – President Obama, Hillary Clinton and John Kerry. Zucker’s latest political piece warns of the “Side Effects” that surely could result from the absurd agreement opposed by congressional majorities and a majority of Americans. The Zucker piece entitled, “Side Effects” spoofs the popular prescription drug advertisement formats which include a litany of possible drug side effects. Vision for America (VFA) is releasing the video as part of a national advocacy effort to highlight misguided efforts of Democrat leaders and their policies. VFA will ensure public awareness of the negative side effects of the deal and drive national policies and leadership in a safer, more secure direction in 2016. See the video at IranSideEffects.com. David Zucker is an American film director, producer and screenwriter. A master of parody comedies, Zucker wrote and directed the critically acclaimed “Airplane!” film, created “The Naked Gun” franchise, and helped create many other fan favorites such as “Ruthless People”, “Scary Movie 3 and 4”, “Top Secret” and “BASEketball”. Vision for America is a non-profit organization founded in 2012; their mission is promote principles of fiscal responsibility, constitutionally limited government and free markets through grassroots education, mobilization and advocacy. Move America Forward was initially formed in response to concerns raised by U.S. troops that the news media was frequently presenting inaccurate coverage that often ignored the success of their missions and accomplishments in the War on Terror. MAF began holding rallies to support the troops where patriots could display their flags and it quickly transformed into a year round care package program. Conducting national bus tours, sending delegations overseas, working with military servicemen and women, pro troop companies, service organizations, and many other supporters from all across the nation to benefit our troops. Move America Forward (MAF) is a military charity and the nation’s largest grassroots pro-troop organization, MAF is dedicated to supporting the brave men and women of our Armed Forces and their missions to defeat terrorism. MAF is supported by hundreds of thousands of pro-troop activists, veterans, and military families all across the nation who share in our unwavering support. We work with other non-profits, military service organizations, corporate sponsors, community networks and private citizens to support our Military and demonstrate affirmatively our appreciation and admiration for their service to America. It is our strong belief that American citizens must be enlisted in the effort to let our troops know that they are in our hearts and prayers and that we will defend their service and honor them here on the homefront while they protect America on the frontlines overseas. MAF’s Care Package Program has delivered over 315 tons of care packages to the front lines of Afghanistan and Iraq. In partnership with our supporters each Care Package comes with a wide array of popular items requested by our troops. Most importantly they include a personal message from the person who donated the care package. To find out more about other Care Package features like the “Candy Diplomacy” program with our partner the Jelly Belly Candy Company and the other great items in please visit our Troop Care Package Page or see the latest on our Home Page. Author oneway2dayPosted on September 15, 2015 September 15, 2015 Categories Activism, Congress, Conservative, Democrats, Foreign Policy, Left Wing, WarTags Barack Obama, Congress, David Zucker, Democrats, Hillary Clinton, Iran Nuke Deal, John Kerry, MAF, Side Effects, Video Parody5 Comments on MAF – Stop Obama’s Iran Deal! Joe Lieberman is a former Senator from Connecticut and was the 2000 Democrat Party nominee for Vice President. In his last Senatorial election the Dem Party dumped him for a younger guy. Lieberman did not appreciate the lack of support so ran as an Independent and won re-election. 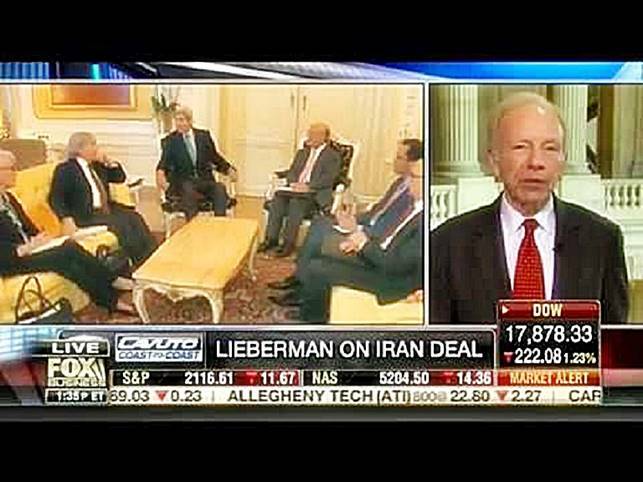 On August 14 Joe Lieberman wrote a very logical yet scathing denunciation of Obama and Kerry’s Iran Nuke Deal. It is worth the read. United Against Nuclear Iran (UANI) Chairman Joseph I. Lieberman, former U.S. Senator from Connecticut, called on Congress to reject the Iran agreement in an op-ed published Friday, August 14 in The Washington Post. As debate intensifies over the nuclear agreement reached with Iran, the Obama administration has sought to deflect criticism by arguing that there is no alternative to the current framework, no matter what its flaws, and that its rejection by Congress is guaranteed to produce catastrophe – isolating the United States from its allies and destroying any prospect for a diplomatic settlement. A vote against its preferred policy, the administration has argued (not for the first time), is a vote for war. The administration has used these same arguments before to try to stop Congress from imposing economic sanctions on Iran. Not only did the predictions of catastrophe fail to deter Congress from moving ahead but also, when the sanctions were adopted, the doomsday forecasts were proven wrong – just as the current predictions will be. And when the scare tactics failed and the vote count in Congress started to turn heavily against its position, the White House changed course – just as it can and should now. I was a member of the Senate when, between 2009 and 2012, Congress developed a series of bills that dramatically increased pressure on Tehran for its illicit nuclear activities, including adopting a measure in late 2011 that effectively banned Iran from selling oil – its economic lifeblood – on international markets. In every case, senior Obama administration officials worked to block congressional efforts, warning that they were unnecessary, counterproductive and even dangerous. Much like today, the White House repeatedly argued that sanctions would isolate the United States and alienate our allies whose help we needed. In the case of the oil ban, a Cabinet member bluntly told members that adopting the measure risked torpedoing the global economic recovery. These predictions proved false. In fact, it was only because of the sanctions adopted by Congress, and ultimately signed by President Obama, that sufficient economic pressure was put on the Iranian government that its leaders came to the negotiating table – a truth the Obama administration now accepts and asserts. Our allies and partners did not always welcome new restrictions on doing business in Tehran, but in the end, they decided it was more important to do business in the United States. It is important for members of Congress deciding how to vote on the current proposal to consider this history because it reminds us of the administration’s past misguided efforts to stop, slow or weaken sanctions bills. Equally important, recent legislative history tells us that as bipartisan congressional support for these bills began to snowball, the White House shifted its position. At first, members of Congress – particularly Democrats – were warned not to do anything. But as the administration began to see the votes slipping from its grip, it changed tack and started negotiating the timing and scope of the prospective new law. Indeed, the same drama played out just a few months ago, as Congress debated whether it should review the then-impending nuclear agreement. Here too, the White House insisted that requiring legislative review and approval of a nuclear agreement with Iran was obstructive and damaging. But when Democrats began to support the legislation, and it was clear that a strong bipartisan coalition was converging around the idea, the administration withdrew its opposition and the president signed the legislation. The current congressional review is the result. Congress should keep this experience in mind as it reviews the nuclear agreement with Iran. While the White House predictably is trying to scaremonger Capitol Hill into taking no action, experience and common sense suggest that the reality after congressional rejection is likely to be quite different. In the aftermath of Sen. Charles Schumer’s (D-N.Y.) principled and courageous stand against the proposed agreement, the prospects for such a bipartisan rejection seem increasingly likely. If a bipartisan supermajority does in fact begin to cohere in criticism of the undeniable loopholes and inadequacies of the agreement, it is likely the administration will adjust its position. Provisions that today are impossible to change will become subject to renegotiation and clarification. The best chance for a better deal, in other words, is overwhelming bipartisan pressure from Capitol Hill about the need for one, rather than acquiescing to the Obama administration’s claim that this is the best agreement possible because Iran will go no further. That conclusion overlooks two truths: First, the Iranians are historically capable of adjusting positions they have claimed were immovable to new political realities, and, second, Iran, because of its depleted economy, needs an agreement much more than we do. Congress has the power now to act on these two realities. This is an initiative, moreover, that many of our friends and partners are likely to welcome. Certainly the countries most affected by the deal – Israel and the Gulf Arab states – have made no secret of their dismay at the concessions granted to the Iranians in the quest for a settlement. Reportedly, even some of our European allies may not be wholly displeased by some congressional push-back – even if not all of them admit so publicly. Not so long ago, everyone agreed that no deal with Iran was better than a bad deal. Now, the administration has changed the standard to whether it is possible to get a better deal than the flawed one it got in Vienna. History suggests it is – but we will never know unless a bipartisan super-majority comes together to demand it. United Against Nuclear Iran (UANI) is a program of the American Coalition Against Nuclear Iran, Inc., a tax-exempt organization under Section 501(c)(3) of the Internal Revenue Code. The Institute for Strategic Dialogue (ISD), based in London, is an independent think tank that works closely with leaders in government, business, media and academia to develop multi-country responses to the major security and socio-economic challenges of our time and enhance Europe’s capacity to act effectively in the global arena. ISD’s activities seek to foster leadership and stability across Europe and its wider neighbourhood, actively bridging inter-communal, religious, socio-economic and political divides.